I’m not sure that I write for peace as much as for the consciousness that creates the willingness to recognize peace. I am in a restless ‘conversation’ with ‘America’ — I alternate between great rage and a passion for justice – I don’t write poetry as art for arts sake, although I believe it is crucial to learn the craft — but what am I here for, if not to build an active, muscled, true peace? 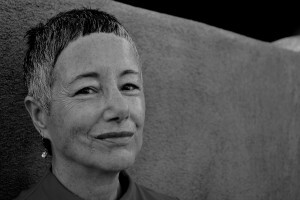 Veronica Golos is the author of Vocabulary of Silence, winner of the New Mexico Book Award, poems from which are translated into Arabic by poet Nizar Sartawi, and A Bell Buried Deep, co-winner of the 16th Annual Nicholas Roerich Poetry Prize (Story Line Press), to be re-issued by Tupelo Press. Her most recent poetry book is Rootwork: The Lost Writings of John Brown & Mary Day Brown, (3: A Taos Press, 2015). Golos is the Poetry Editor for the Journal of Feminist Studies in Religion (Harvard Divinity School), and co-editor of the Taos Journal of International Poetry & Art. She lives in Taos, NM, with her husband, David Pérez. Golos’s poems are included in The Poet’s Craft, Annie Finch, Editor, 2012, University of Michigan Press; Collecting Life: Poets on Objects Known and Imagined, 3: A Taos Press, 2011, and in journals including Spillway, Meridians, Drunken Boat, Orion, Cimarron, Contemporary World Literature, Sin Fronteras, Verso (Paris), Poetry (London), Rattle, World Literature Magazine Spring’s Forum. Translated Poems from Vocabulary of Silence have appeared in over 24 journals and publications throughout the Middle East including (Syria), www.nabee.awatf.com, www.saddana.com, (UAE),www.shenrayar.com/ar, (Iraq) www.Alimbaratur.com (Denmark) and Maqal (Kuwait). Golos is Acquisitions Editor for 3:A Taos Press, and co-editor of the Taos Journal of Poetry & Art. In this two-part interview, Veronica Golos talks with Sam Hamill about the role of poetry, living reality, and love. Part one can be found here, and part two here. “Vocabulary of Silence”, the title poem to Veronica Golos’s award winning book is featured in Daily PAW Post, No. 20, with its Arabic translation by Nizar Sartawi. “Dream: The City: Baghdad, 2008” was featured in Daily PAW Post, No. 13, with its Arabic translation by Nizar Sartawi. “For Fallujah” was featured in Daily PAW Post, No. 8, with its Arabic translation by Nizar Sartawi. “For Gaza,” and its Arabic translation, by Nizar Sartawi,is featured in our first issue of DoveTales, an International Journal of the Arts. The journal will released the end of the March, 2013.